When you are looking for the right sleeping space for your new born or young baby, safety, comfort, and ease of use/access are usually all top concerns. Many parents hope to find a solution that will both keep their baby safe at night, and which will still allow them to remain close by. 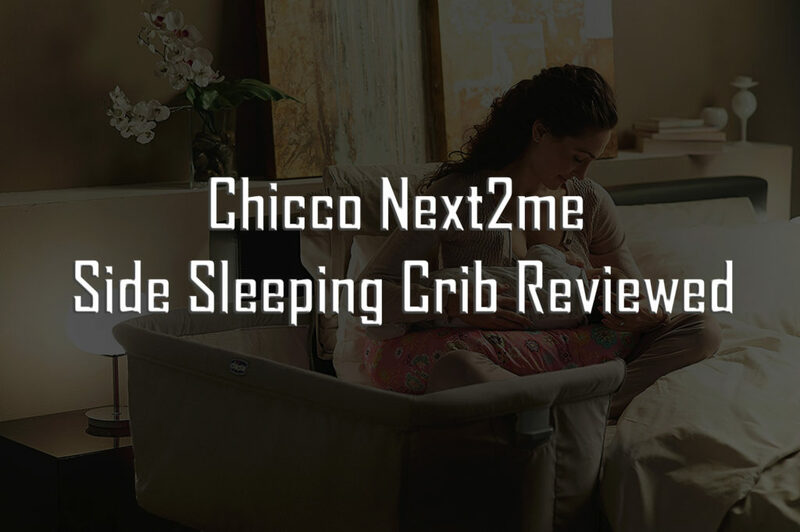 The Chicco Next2me Side Sleeping Crib is an excellent solution. As a co-sleeper cot, it provides the space and stability for safe sleep habits, while allowing mum and dad to have easy access to baby, even without getting out of bed, and is especially perfect for parents on the go. There are so many great things about this co-sleeper. First, it is extremely versatile! Because of how sturdy it is, you can use it for up to the first 6 months of your baby’s life, which is much longer than the standard bassinette or Moses basket. This means fewer pricey purchases for you! Also, because it is so sturdy AND because you can leave all sides up, it can function as a traditional crib, meaning that when you and baby are both ready, you can gradually move her away from your bed and into her own nursery to help ease the transition. Finally, its versatility is not only in the stages it is suitable for, but also the beds it is suitable for. Because of the adjustable height and foldable feet, this baby side sleeper can pair up with almost every size and type of bed you might have. Second, it is incredibly easy to care for, use and transport. Because of its cloth lining, you can remove and wash it regularly with ease to keep baby’s sleeping space clean. The whole cot also folds up very compactly into the included travel bag, making it easy to store or travel with, which is great since baby won’t have to get used to a new sleep space if you do go out of town. Add to this the fact that the feet have rollers, and it is extremely easy to move around your living space as well, should you want to move her to a different space during nap time. This is one of the most affordable options on the market. You’re sure to be getting your money’s worth because of all its aesthetic benefits. This is definitely one of the best deals available on the market. 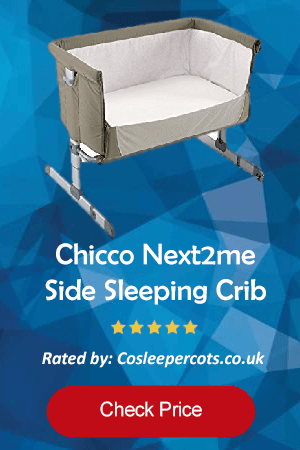 The Chicco Next2Me is a co-sleeping crib constructed of a cloth basket and a metal frame with feet at the head and base. There are two belts on the underside of the crib that attaches its frame to the parents’ bed. This ensures a secure and safe attachment, and even further prevents any possibility of tipping. It also prevents there from being any gaps between the parents’ bed and the crib for when you lower the drawer side. Even if the parents’ bed is a drawer bed, the cot’s feet can fold so that it can get right against it without issue and be safely connected. The legs of the crib offer 6 height options and the legs can be adjusted independently, which means you can adjust it so that it has an incline, easing any reflux or congestion your baby might have. This also makes it a versatile fit for almost any type and height of bed you may have. The basket portion of the crib is constructed of a cloth and mesh material that is removable and washable for easy care. One side can be unzipped, lowered and attached to mum and dad’s bed, allowing mum or dad to see and reach over to soothe baby at all times. As the baby grows and you want to start getting him used to sleeping independently, you can keep all sides zipped up and begin moving the crib further from your own bed and even into his own room. It is fully functional as a stand-alone crib up through age 6 months/9kgs or until he starts pulling himself upright. Materials: drawer side is made of mesh for better ventilation and visibility; cloth linings which are removable and washable; interior lining is made of cotton for greatest comfort.